Follow me on Facebook for all the latest news. If you read this article, you probably already noticed that Facebook Live polls are today’s hottest social media trend. My guide for creating a simple ‘Facebook Live poll from a computer without code and for free‘ gets thousands of hits a day from Google’s search. In this guide I’ll share with you a new method for creating Facebook Live polls, but this time you won’t even need your computer as it all happens in your mobile phone. In recent post I explained how to go live on Facebook from a pro camera using the CameraFi Live app for android, today they updated the app so you can create a Facebook Live poll directly from the app, super simple- just a few clicks and no coding needed. It’s free and you can upgrade the result if you pay a small monthly fee to get some pretty cool features. Want to learn more about Facebook Live? Have technical problems? Join our Facebook Live Professionals community! 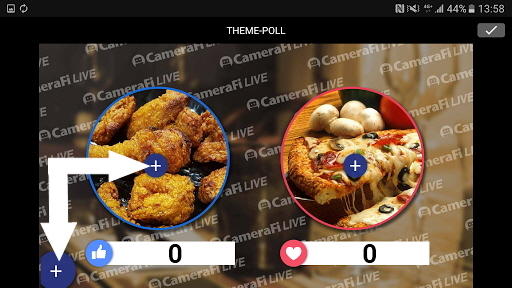 Unlike other Facebook Live polls, using CameraFi Live poll lets you broadcast the poll to your personal profile if you wish to create a poll for your friends to vote, while still allowing you to share it from your business page or share it into a group you are in. 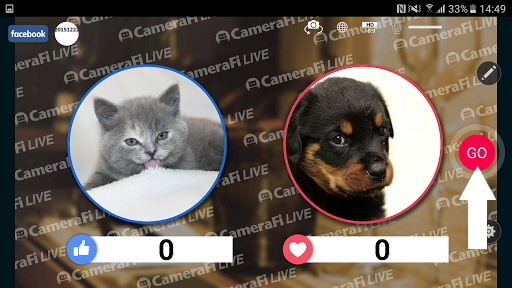 The only downside to this app is that you have to keep the CameraFi Live app as long as the poll is running. Closing the app for other mobile uses, will pause and finish your Facebook Live broadcast. 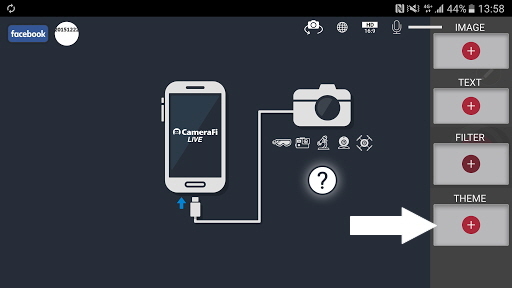 Download the CameraFi Live app to your android, if you already have it installed, make sure you update to the latest version. After you connect your Facebook account with the app and select where to broadcast your poll, swipe from right to left for the right swipe menu which is showing THEME and select the only theme currently available- Poll. After choosing Poll you’ll be able to upload 2 images from your mobile device’s storage for people to choose from. There is no option to have more than 2 options at the moment, and one of the options is the Like reaction, which gets far more votes, being the 1st and most commonly used Facebook reaction.Click the images to select your own images. You can also upload a background by clicking the + in the bottom left corner, but that is a paid feature. The default background is the one in the image below. When you finish uploading your images, click the V in the upper right corner to proceed. Tip: to disable the audio (you don’t want people to hear you talk during this stream anyways), swipe the main screen from left to right and click Audio to disable the mic. Now you are all set, click the Go button to start streaming, the app will open a new live video for you and will allow you to share it once you go live. You can use the app’s special features as well as read the comments people leave on your post, for the full list of features, read this guide. Do you have a guide to use for iPhones? No. Didn’t see any solution yet. Copyrights © 2014 GeekStyle. All Rights Reserved.